Parisian haute couture meets contemporary design, fused with Asian heritage all set in a historic Art Deco building. You can easily picture the typical client that dwells in the Mandarin Oriental Paris: someone sophisticated yet very discreet, who takes great pleasure in exquisite design. 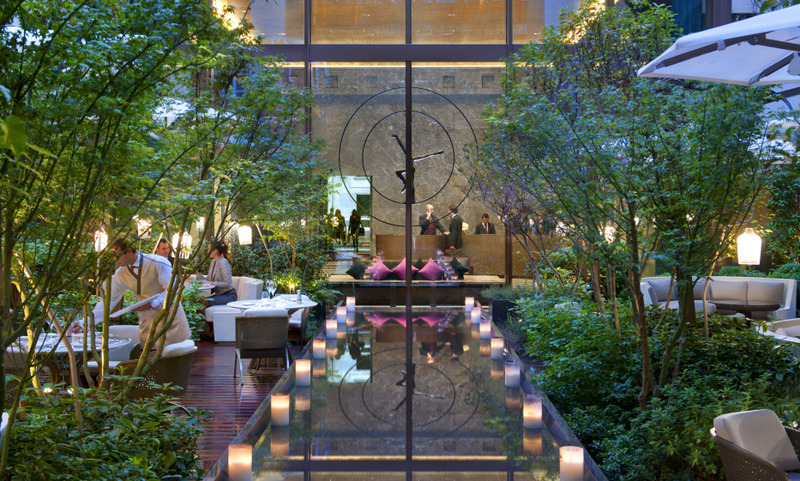 They unwind in the lobby’s manicured garden, delightedly sample Thierry Marx’s concoctions. They enjoy the ease at which, in seconds, they exit the hotel and enter the major fashion houses, contemplate and purchase their offerings. It’s also easy to picture who that typical client may be, since the Mandarin Oriental has garnered a stellar array of fans – so much so, the company’s concocted an entire campaign featuring celebrities who love to call the hotel home: Isabelle Huppert was photographed in one of the Mandarin Oriental Paris’ decadent rooftop suites. The hotel’s a star in its own right, too: it was recently awarded ‘Palace’ status, which means it’s one of the ten most exclusive hotels in the capital. Discover an eight-storey hotel in a 1930s listed building, with a vast indoor landscaped garden. Have a dinner at Sur Mesure par Thierry Marx, a gourmet two Michelin-starred restaurant: an intimate haute couture setting beneath a light well. Being pampered in the 900 sq.m. Spa on 2 levels with stunning high ceilings and a 14 metres long indoor pool. The Mandarin Oriental Paris is a happy blend of high quality irreproachable performances and virtuous Human History. This modern residence is above all exceptional service provided by talented men and women concerned about your holistic development. A favorite for the warm new Director of the restoration ,,, We can finally salute the humility of a highly experienced, infinitely benevolent and fortunately daring management. MAGIC ! Great location. impeccable service. and the food at the restaurant Sur Mesure par Thierry Marx is something to die for. Everything was perfect, we love to stay in the Mandarin Oriental Paris. This time we were accompanied with our dog, and they were more than friendly and very kind to the dog. A beautiful hotel and no doubt one of the best in France in regards to quality of service. Congratulations. We arrived at the hotel and were invited to the lounge and offered a glass of champagne. Afterwards we continued our check-in in the hotels garden perfect place! the hotel has fresh flowers everywhere also in the room, which were changed during our stay of 4 nights at least 3 times. The room was nice, but the bathroom was a little bit disappointing - too small. The design of the hotel, with its fresh flowers and gorgeous gardens,brings an oriental touch, right in the middle of Paris’s historic buildings - a real escape! Great concierge and hotel in general, and if you don't look for classic style hotels, this is something particular! we also tried the 2-star michelin restaurant Sur Mesure, the 9-course menu was in fact 11 or 12 courses - amazing staff and a very good atmosphere. A very nice hotel with great rooms, great breakfast service and well located too. What particularly pleased us was the friendliness and warmth of the staff in general. We felt immediately comfortable at the hotel. The hotel's location is excellent for shopping, restaurants and to try the city’s nightlife. Everything you want from a luxury Hotel in a perfect location for us in center of Paris. We walked to all icons from this location. From the general manager Pierre who personally welcomes us at his hotel and greeted us every morning at breakfast to Maria, Kamal and Marine (I never remember names) our waiters at breakfast who went above and beyond not only ensuring our breakfast was 100% but assisting us with concierge to plan our days and share local knowledge. They were very approachable professional and fun. Special thanks to Maria- we will not forget you. This was our 5th visit to Paris and although it was timed badly with the Friday 13th Massacres which saddened us all, we were made to feel safe by the manager Pierre and we will always stay in this hotel from now on. We feel its the best, clean, modern, perfect staff, perfect room and facilities and perfect location. That was our experience. An incredible experience which I will not hesitate to repeat as soon as possible. I would like to highlight the incredible kindness, the exceptionally warm welcome and efficiency of the staff. In one word: Perfect. It is obvious that this gem of a hotel is the most enticing modern palace in the city of light and its brilliance has seen it enter the very elite club of the best hotels in the world. It’s now even a source of inspiration for other prestigious Parisian and international hotels. Its unique brand of contemporary and bespoke luxury is ideal for the modern client. You will be amazed by: the spectacular: “secret garden, so Parisian”; its modern cuisine in the two Michelin-starred “Sur-Mesure” and the Camélia which deserves a star with its novel approach which excites the tastebuds and, its enchanting spa. Its wide variety of experiences makes it a Palace of distinction with great quality of service… in short, you’ll be a fan!! Beautiful hotel and impeccable service.